Many of us are probably familiar with Disney’s 1964 musical-film starring Julie Andrew as the delightful, simply wonderful nanny, Mary Poppins. While Disney’s Mary Poppins is indeed supercalifragilisticexpialidocious (even more so with her philosophy that “a spoonful of sugar helps the medicine go down”), you would be missing out if you have never met the original Mary Poppins. Written by P.L. 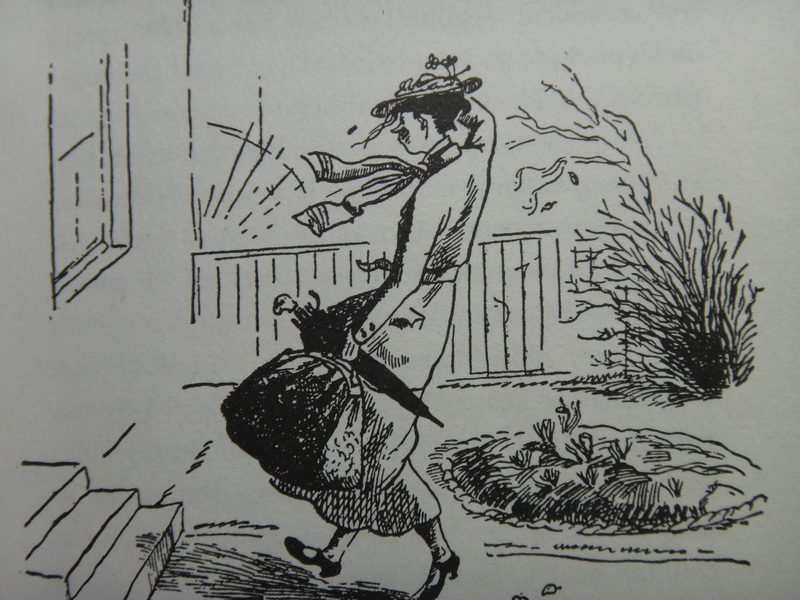 Travers with illustrations by Mary Shepard, Mary Poppins is the world’s most beloved nanny. Arriving at Number Seventeen Cherry-Tree Lane with great style — blown over by the East Wind, Mary Poppins brings adventure, enchantment and excitement to the Banks house (and to you)! Indeed, Mary Poppins is a most unusual nanny to Jane, Michael, and John and Barbara (the twins). She turns ordinary, everyday happenings extraordinary. Instead of sliding down the banister, she slides up. Instead of her employers (the Banks) determining her credentials, she evaluates the children to see if they will do. From the very beginning, Mary Poppins topples the way how things should be done. Suspend your disbelief and prepare for what’s strange and wonderful. A Mary Poppins adventure interweaves reality and magic (imagine, going into a painting for your vacation or catching laughing gas and have your tea in the air). Mary Poppins is not just Miss-Perfect-Nanny, she has her faults. “Just look at you!” said Mary Poppins to herself, particularly noticing how nice her new gloves with the fur tops looked. They were the first pair she had ever had, and she thought she would never grow tired of looking at them in the shop windows with her hands inside them. But specifically because Mary Poppins is very vain and likes to look her best, when she gives her new gloves away as Christmas present to Maia (the Pleiades, Seven Sisters), you understand the magnitude of her act. You forgive her haughty retort to Mrs. Banks, ” ‘My gloves are my gloves and I do what I like with them!’ “, because Mary Poppins is kind deep down. Read and let the original Mary Poppins, with her no-nonsense “spit-spot,” take you to fairyland. This entry was posted in Book, Did you know... and tagged children's book, Mary Poppins, Mary Shepard, P L Travers, supercalifragilisticexpialidocious on December 11, 2012 by Sherry.